Saudi Arabia rejects political and economic "threats" over missing journalist Jamal Khashoggi, a source quoted by state news agency SPA says. The country would respond to any punitive action "with a bigger one", the unnamed senior source said. US President Donald Trump said he would "punish" Saudi Arabia if it were found responsible for killing him. On Sunday a joint statement by the foreign ministers of the UK, France and Germany called for a credible investigation to ensure those responsible for Mr Khashoggi's disappearance were held to account. "We encourage joint Saudi-Turkish efforts in that regard, and expect the Saudi Government to provide a complete and detailed response," said Jeremy Hunt, Jean-Yves Le Drian and Heiko Maas. 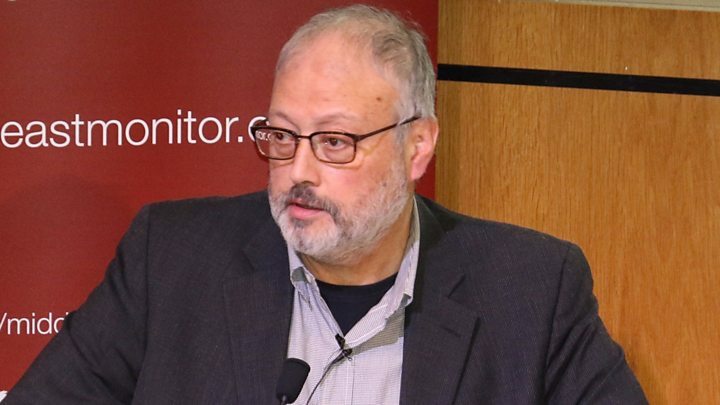 "If, as they say, this terrible murder didn't happen, then where is Jamal Khashoggi? That's what the world wants to know." Britain and the US are considering boycotting a major international conference in Saudi Arabia this month. The authorities in Istanbul believe Mr Khashoggi was murdered in the consulate by Saudi agents - claims Riyadh has dismissed as "lies". What have the Saudis been saying? The source quoted by SPA said: "The kingdom affirms its total rejection of any threats or attempts to undermine it whether through threats to impose economic sanctions or the use of political pressure. "The kingdom also affirms that it will respond to any action with a bigger one. The Saudi economy has vital and influential roles for the global economy." But on Sunday evening King Salman appeared more conciliatory, thanking Turkish President Recep Tayyip Erdogan for setting up a joint team to investigate the disappearance. No-one could undermine the strong relationship Saudi Arabia had with Turkey, he said. The Saudis have come under considerable international pressure over the disappearance. Diplomatic sources told the BBC's James Landale that both US Treasury Secretary Steve Mnuchin and UK International Trade Secretary Liam Fox might not attend next month's investment conference in Riyadh, which has been dubbed "Davos in the Desert". However, later White House aide Larry Kudlow told ABC News that as things stood Mr Mnuchin was intending to go to Riyadh and would take a final decision "as new information surfaces". The event is being hosted by the kingdom's Crown Prince Mohamed bin Salman to promote his reform agenda. Several sponsors and media groups have decided to pull out. The president has said the US will inflict "severe punishment" if Saudi Arabia is found to be responsible for the death of Mr Khashoggi. Turkish Foreign Minister Mevut Cavusoglu said Saudi Arabia had not so far co-operated with the investigation - despite a statement from Saudi Interior Minister Prince Abdulaziz bin Saud bin Naif bin Abdulaziz saying his nation wanted to uncover "the whole truth". Salah Shamma, of Franklin Templeton Emerging Markets Equity, told Reuters: "The market is reacting negatively to sentiment around the Khashoggi case." Reports suggest an assault and struggle took place in the consulate after Mr Khashoggi entered the building to get paperwork for a marriage. Turkish TV has broadcast CCTV footage of the moment Mr Khashoggi walked into the consulate. 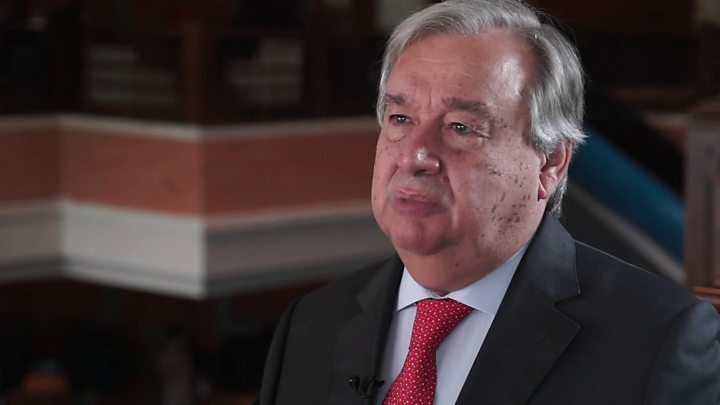 Media captionSecretary General Antonio Guterres told the BBC's Kamal Ahmed "we need to know exactly what has happened"